Investors already know that dividend growth is a powerful tool for gaining financial independence. Dividends provide passive income that investors can use to augment their salary (and replace it in retirement), and dividend-paying stocks have historically outperformed non-dividend payers over the long-term. That's in part because dividend growers can be more resilient in bear markets. 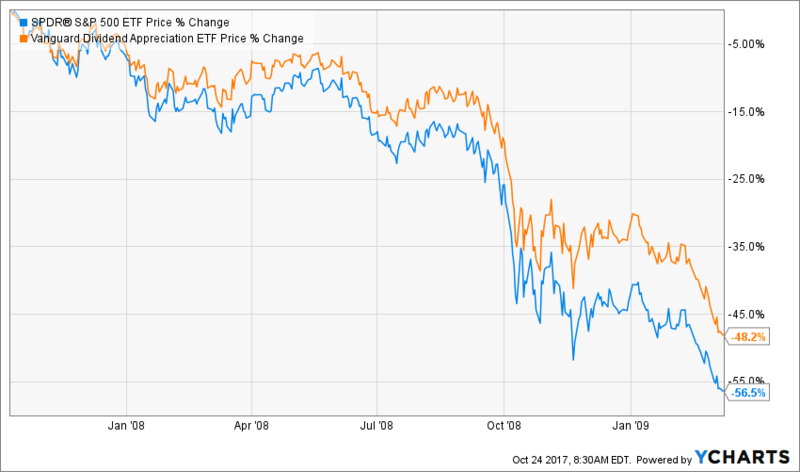 Consider that during the market meltdown of 2007-09, the Vanguard Dividend Appreciation ETF (VIG) — an exchange-traded fund investing in dividend growth stocks — outperformed the Standard & Poor's 500-stock index-tracking SPDR S&P 500 ETF (SPY) by a considerable margin of 14.7%. Eric Ervin, chief executive officer of ETF provider Reality Shares, says the reason dividend growth stocks can outperform is because, on the average, they represent sturdier businesses. "Companies that grow their dividends tend to have healthier fundamentals, making them better investments in the long-term," he says. When the going gets tough, look for companies that are willing and able to share more of their profits with investors. Here are eight of the best bear-resistant dividend growth stocks to consider. Data is as of Oct. 23, 2017. Dividend yields are calculated by annualizing the most recent quarterly payout and dividing by the share price. Click on ticker-symbol links in each slide for current share prices and more. Don't be scared by Mastercard's rapid multiyear run and low headline dividend yield — this is a sleeping giant for income hunters. Mastercard's dividend growth has been astronomical over the past decade, from less than a penny per share quarterly at the start of 2007 to its current payout of 22 cents. The lion's share of the dividend's expansion has come in the past five calendar years, growing at a compound annual rate of 66%. Anyone who bought MA shares a decade ago and held on is looking at a yield of cost around 5%. But the current yield is so low because Mastercard's stock price — up 860% since October 2007 — has surged alongside the massive dividend increases. That trend is likely to continue for several reasons. For one, cash still makes up 85% of all global transactions, meaning there's still immense room for card-based growth. McKinsey Global Institute expects the global payment industry's revenues to jump 22% between 2015 and 2020, to $2.2 trillion. That's a rising tide that should help not just Mastercard, but competitors such as Visa (V) and American Express (AXP). The rise of mobile payments — whether it's Apple's (AAPL) Apple Pay, Alphabet's (GOOGL) Google Wallet and other providers that connect their technology to credit and debit cards — also should prop up MasterCard's top and bottom lines. To understand the appeal of CVS Health, consider its operational performance during the 2007-09 financial crisis. While many companies were bleeding out, CVS grew its revenues from $76.3 billion in 2007 to $98.2 billion in 2009. Shares fared better than the broader market, too, still losing 37% — but that was 19 percentage points better than the broader market. CVS Health shares have stumbled more than 30% since August 2015 as investors feared a Walgreens Boots Alliance (WBA) takeover of Rite Aid (RAD) would create a behemoth overtaking CVS' market share. While Walgreens still will become the No. 1 largest drugstore chain by locations thanks to a revised agreement to snap up some of Rite Aid's businesses, the result was far better than what CVS would have faced. Expect Wall Street to give CVS shares a fresh look soon. After all, amid all those worries of the past few years, revenues and earnings still have been growing, and analysts expect CVS Health to continue expanding the top and bottom lines this year and in 2018.
Dividend growth investors will love that CVS has more than doubled its payout since 2013, and a payout ratio of just 34% of this year's forecast earnings, meaning the pharmacy chain has plenty of room to expand its distribution. Southwest Airlines has received an important vote of confidence from Warren Buffett, who dipped Berkshire Hathaway's (BRK.B) toe into the stock in late 2016, then bought more in early 2017 because, to quote the Oracle of Omaha, airlines "got a bad century out of the way." Buffett believes the survivors of the roughly 100 airline bankruptcies of the 20th century can take advantage of economies of scale to improve operating margins. Southwest is a prime example of that, growing operating margins from 8% in 2007 to 18.4% in 2016. The once-regional budget airline has been expanding for more than two decades through boom and bust times alike. This year, the company announced it would sprawl farther internationally, adding new routes in Mexico and the Caribbean. Southwest has been able to grow in part because of its increasingly loyal customers — a product of management's focus on customer service that has resulted in high satisfaction scores, including the top rank in J.D. Power's 2017 survey. Expect the airline to remain popular even in an economic downturn thanks to its wallet-friendly fares. Southwest's dividend has also exploded over the past few years, from a mere penny per share to its current 12.5 cents, which included a 25% boost announced in May 2017. Shares of contract petroleum drilling company Helmerich & Payne have struggled ever since the 2014 decline in oil prices. Oil collapsed from more than $110 per barrel three years ago to below $30 by 2016, and has only mildly recovered to current prices just above $50. However, Helmerich might have one of the most resilient dividends in the energy sector. Its payout has not only survived but grown in the wake of the 2014 oil crash, but also dips in 2008 and the late 1990s. In fact, the company has increased its annual distribution for 44 consecutive years — putting it among the ranks of the Dividend Aristocrats — and is expected to keep that streak intact for 2017. H&P took on a mountain of debt following the oil crash, but management has already started to pay that off. Meanwhile, the company recently said that it's seeing increased demand for its more efficient alternating current rigs, and stabilizing oil prices — while not ideal at current levels — have the company off the cliff it faced back when oil plumbed $30. A yield of more than 5% is ample motivation to hold on while the company works on its recovery. Semiconductor companies such as Skyworks Solutions (SWKS) and Qorvo (QRVO) have gotten lifts in the past because of the widely publicized use of their products in Apple's (AAPL) exciting consumer product lines, including the iPhone and iPad. Texas Instruments isn't nearly so trendy, but that's not a disadvantage. TI designs and makes analog chips and embedded processors for a wide range of consumer products, but more largely industrial and commercial applications. Its products can be found in mobile phones, but also in everything from lighting to automated factories to flight control systems. Its "dominant position in the analog industry" is why institutional broker Rosenblatt Securities called TXN a good "long term and income oriented investment" earlier this year. Its wide customer base and product diversity helps to protect against revenue swoons in economic downturns. Meanwhile, its expansion into additional automotive and industrial applications is paying off in a steady multiyear ramp-up in profits. Texas Instruments also is one of the strongest dividend growth stocks in the semiconductor space, nearly tripling its payout from 21 cents per share at the beginning of 2013 to its current 62 cents. Its most recent hike, in September 2017, was a 24% improvement and marked the company's 14th straight dividend increase. Cummins is an essential cog in global infrastructure, producing a variety of engines and engine-related machinery to large companies around the world. If you drive, chances are you've been alongside numerous semi trucks powered by Cummins' technology. Even high-quality truck engines routinely need to be replaced, no matter what the stock market or economy is doing; free cash flow — the cash left over after essential capital expenditures that can be used to fund dividend payments — actually improved from $411 million in 2007 to $790 million in 2009. That's why even if the stock is battered — CMI underperformed the S&P 500 during the 2007-09 bear market — investors shouldn't worry. Fundamental demand and strong underlying operations mean the stock will recover. That's exactly what Cummins did after its 2007-09 decline, recovering to all-time highs by 2010, and even increasing what it paid investors along the way. In fact, Cummins has delivered 12 straight years of higher annual payouts. Considering the company still pays out less than half its income as dividends, you can expect this stock to continue producing dividend growth. Also, investors shouldn't worry that Cummins might be left behind as the world's automobiles shift away from fossil fuels. The company in August unveiled an electric Class 7 heavy-duty truck cab that it expects to begin producing in 2019. Health insurance has been in Washington's crosshairs for years, and President Donald Trump's recent executive order to cut key Affordable Care Act insurance subsidies has kept investors skittish on the sector. One company that has survived the uncertainty around the health insurance industry is UnitedHealth Group. For one, the insurer in 2016 began exiting all but a few ACA markets, as those plans dragged on the company's profitability — minimizing any effect the loss of those subsidies would have. UnitedHealth also will benefit from continued customer growth in its Medicare and retirement plans, and the company continues to squeeze higher profits from its Optum pharmacy benefits management segment. The company's free cash flow has broadly been trending higher for years as a reult. That has fueled continued growth in its regular payout, which is 500% bigger than when the insurer switched to quarterly payouts in 2010. That includes a 20% hike announced in June 2017. Lastly, continuing with the insurance theme, Progressive has grown for decades to become the nation's fourth-largest auto insurer by market share — behind State Farm, Berkshire Hathaway's Geico and Allstate (ALL) — largely thanks to its, ahem, "progressive" offerings of price-comparison tools and online sales. The company's shares have reflected that, running up 165% over the past decade, which includes a 38% breakout in 2018. That has come in part thanks to much lower-than-expected losses from Hurricane Harvey of $230 million versus a $550 million estimate — a factor that caused Credit Suisse's Ryan Tunis to upgrade the company to neutral (equivalent of hold) in September. Raymond James' Gregory Peters also believes Progressive is one of the better-positioned companies to monitor distracted driving and price it into its models. Progressive is an outlier among these stocks in that it pays an annual dividend, and one based on the performance of its business. This means the company won't automatically improve the dividend each year, but as its business grows over time, the broader direction of its payout will be up. For instance, while its 2017 distribution in February of 68 cents per share was down from 2016's 88 cents, it's still roughly 65% higher than its dividend from five years ago.